Ya'll know my hangups about islands. I don't like 'em. I know, it's weird, especially given that my peoples come from islands, I live on the island of Manhattan, and the only other place I could see me living is the island of Great Britain (or whatever it's officially referred to). But remote islands? I cannot do. Too far from help. Seriously. And if you're in trouble, where do you go? I have to admit something here, though. In my head, Key West has always been on my list of those remote islands. Everyone always talks about how you have to drive all the way out to them, and Jimmy Buffett sings about them (doesn't he? ), and for pete's sake, even Joey Potter and Pacey Witter took their sailboat all the way out there. So with all those stories, and all those songs, and with every magnet that folks bring back for me from here, in my head, Key West was this island with a couple of coconut trees and Ernest Hemingway's house. Oh, and some cats. 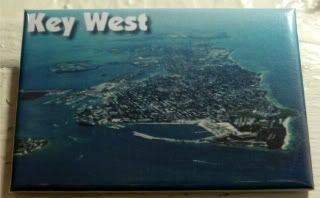 But today when I opened the envelope my friend sent me with this aerial view of Key West (thank you! ), I was completely shocked that it was so big! Mind you, it doesn't mean that I'm going to ever visit, but it does give me a better idea of what I thought was no man's land! Yay! I'm so glad that the magnet made it there!! And yes, it's much bigger than I thought, too. But next time I go, and I hope there will be a next time, I'm flying in. Not that it was a bad drive, but it was long. Whoa, JB, I didn't realize you drove all the way there! That *is* a long drive!! !